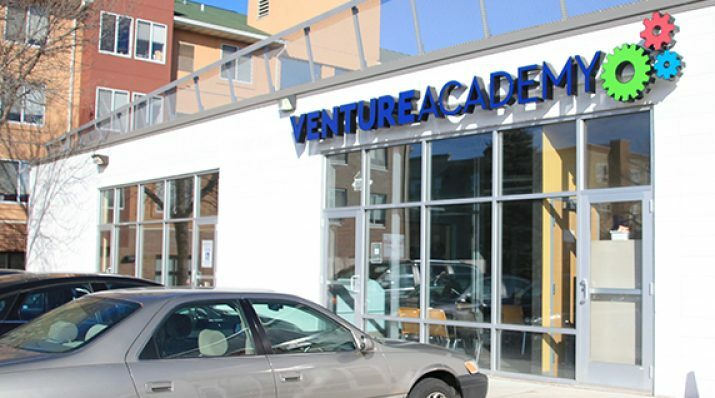 Venture Academy, a 6-12 charter which opened in Minneapolis in August 2013, isn’t just cre­ating 21st century learners. They’re helping grow the next generation of entrepreneurial leaders: self-propelled students who know how to imagine new opportunities, take initiative and risks, and solve problems. The learning takes place on the edge of the University of Minnesota campus, in a pastel-painted, high-ceilinged former printing plant with lots of windows but no classrooms. In Venture’s model, students—one-fourth of whom receive special education services and two-thirds who are learning English—are trailblazers. The learning model is designed to help trailblazers make rapid learning progress by sparking self-direction and passion. Their personalized learning pathways are guided by learning coaches and real-time progress data generated by digital content, coach input, and self-reflections. Trailblazers also receive feedback by earning dollars weekly on Venture Paychecks, which track virtue attainment and learning productivity. The school day includes digital learning, responsive small group coaching in literacy and math, independent study projects known as Learning Quests, athletics, and experiential learning in art, digital media (making music and movies), tech entrepreneurship (web development and coding), and Makerspace (hands-on tinkering and product development). The latter two courses are coached by Venture’s 23-year-old Entrepreneur-in-Residence. Other key activities include a Maker Faire, Life Hack Faire, Think Olympics, auctions, a Venture Exchange to buy and sell trailblazer creations, and entrepreneur guest speakers. All students give a culminating Venture Pitch, demonstrating public speaking, persuasive writing, research, SWOT analysis, and teamwork skills. Venture prepares trailblazers for entrepreneurial leadership by letting them learn from productive failure. In its first month, Venture itself was as much a productive failure as a successful startup. After a month focused on building an orderly culture for students from some of Minnesota’s most struggling schools, its team realized it was not on track to achieve its mission. Venture pivoted, replaced reading and math classes with flexible pullouts and added the tech courses and time for independent projects. A 33-member student leadership team designed an elected government and student jobs to give trailblazers real responsibility for academic coaching, tech support, cleaning, and other previously adult-staffed areas. As it grows, Venture seeks to remain a lean startup with the agility to try, measure, learn, and iterate in rapid data-driven cycles.